Preheat the oven to BROIL. In the meantime, slice the red pepper into spears. Place a sheet of tin foil on a cookie sheet and lay the peppers out on the foil, skins face up. Bake the peppers on the top rack for about 5-10 minutes. You want the skins to be brown and bubbly but not burnt, so watch them closely! Pull them out of the oven and fold up the tin foil to make a little pouch for the peppers. Let them sit for another 5-10 minutes. This will allow them to steam and soften a bit more. Now peel off the skins. They should slide off really easily, but be careful as they will be hot! Discard (or eat!) the skins, and toss a cup of the red peppers with the rest of the ingredients into a blender. Blend until smoooooooth. Super easy, super yummy. 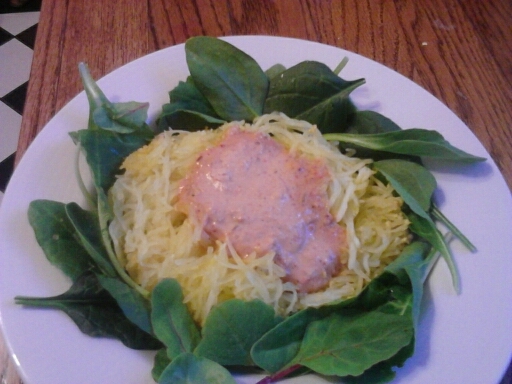 and GLORIOUS with spaghetti squash! !